Sacramento State now has 2020 vision for campus safety. Risk Management Services recently launched an easy-to-remember phone number – dial 8-2020 while on campus, or 916-278-2020 from elsewhere – to report potential hazards. It might be a dangerously dangling tree limb, or flooded bathroom, or an intersection that puts pedestrians in harm’s way, a bad smell, a laboratory spill, or a broken sidewalk that could cause someone to fall. “Safety works better when everyone is involved, and the idea is to let the campus community participate more readily and easily when they feel something is amiss,” says Gary Rosenblum, associate vice president for Risk Management Services (RMS). “We want to reduce the hurdles that keep people from saying something when they see something by coming up with a snappy phone number. If people have to look up a number, they simply won’t call. Before RMS launched the 2020 hotline, the burden was on campus citizens to determine the appropriate department – given the hazard, should they contact Facilities Management, Environmental Health & Safety, or Risk Management? – and then search for the phone number. RMS has long had a dedicated line for hazards-reporting, but Rosenblum admits that even he isn’t sure what it was. Calls to 8-2020 during business hours will be handled by RMS staff or forwarded to the responsible department. Emergency and after-hours calls should go to the Sacramento State Police Department, at extension 8-6000 or 911. “We hope everyone will remember that 2020 and campus safety go together, instead of thinking, ‘I should report that, but I don’t know who to tell’ or ‘I don’t know what to do, so I’ll keep moving,’ ” Rosenblum says. The new 8-2020 reporting tool is in line with the campus-safety imperative President Robert S. Nelsen announced during his Fall 2018 address. Nelsen’s concern was prompted in part by the discoveries of lead dust in Santa Clara Hall labs, elevated lead levels in drinking sources, and a chemical spill in a science lab. The lead dust, determined to cause little risk to those who use the Santa Clara Hall labs, was safely abated. 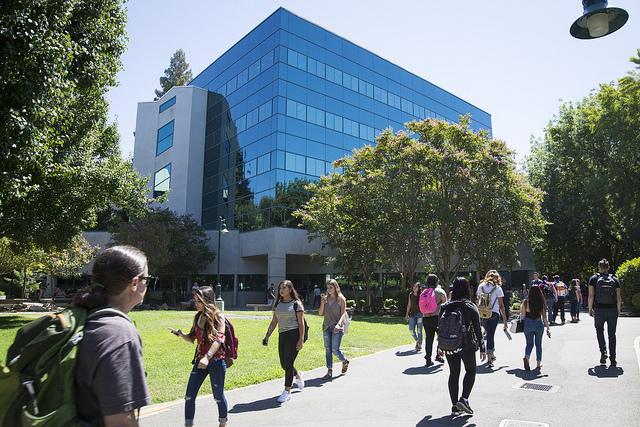 Elevated lead levels found by Environmental Studies students in 43 drinking fountains prompted Sac State administrators to bring in a third-party service to test and analyze 799 campus water sources. Rarely used faucets and fountains were shut down permanently. RMS labeled all campus drinking fountains that were tested and fall below the Environmental Protection Agency’s action level for lead. A QR (Quick Response) code offers additional information for each drinking source. Sac State has long maintained stringent safety standards in chemical research labs. All students who take classes in labs that require personal protective equipment, such as goggles or gloves, will receive safety training from their instructor. This fall, for the first time, the students’ training will be documented. The University also has an active Executive Safety Committee, with members from throughout the campus, that meets three times each semester to address potential risks as quickly as possible.